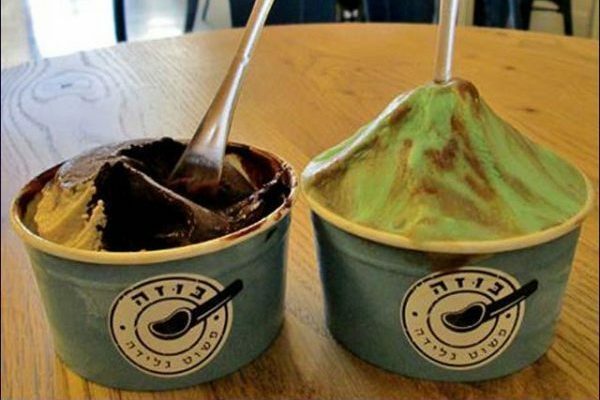 “Buza” a luxurious ice cream parlour in the Western Galil is the venture of Adam Ziv, a Jewish kibbutznik from Sasa and Alaa Sawitat, an Arab Muslim from Ma’alot Tarshiha. Taken from the Arabic word ‘meaning ice cream, this new shop opened in Tarshiha shuk last July and although attracts a mixed clientele, they are all only interested in the homemade new flavours of ice cream on sale that day. During a gap year in Europe and Africa, Ziv apprenticed at gelaterias in Italy, with the aim of returning to Israel to set up his own store. Seeking the advice of his old family friend Sawitat, an experienced restauranteur in Tarshiha, they decided to join forces and open Buza, a partnership that allows Ziv to create the ice cream and leaves Sawitat to run the business. They currently have four ice cream outlets, as well as running a workshop on Kibbutz Sasa, teaching the art of making this sublime creamy dessert. 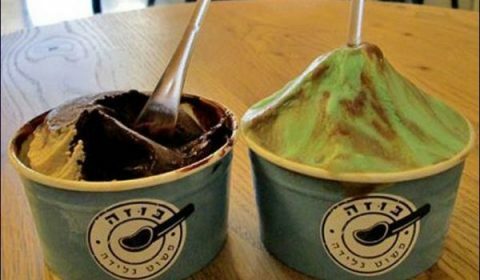 Their motto ‘פשוט גלידה‘ ‘simply ice cream’ is exactly their ethos and one that can be shared by Israeli’s and Arabs alike…..well worth a visit!